This distinct Kiddush cup is a great example of modern style Judaica. It is aimed for those who want to have touch of modern on their table on the Sabbath and holidays. The cup with saucer is a work of artist Yair Emanuel. This outstanding Kiddush cup is a great example of modern style used on the traditionally important utensil. And not only modern – the cup is a design work of Jewish artist Yair Emanuel. The Kiddush cup with the matching saucer is part of the artist's fabulous collection of Anodized Cast Aluminum Kiddush Cup and Saucer Sets. The cup and saucer have elegant forms, and their surface is covered with gleaming silver metallic colour, with the brushed metal finish. 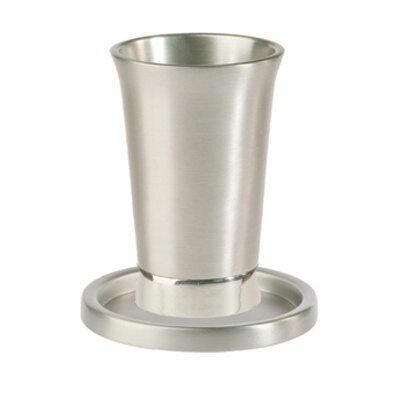 If you like modern style Judaica, this distinct Kiddush cup will perfectly fit your Shabbat table. Let the blessing before meals and recitation of the Kiddush be the special moment, performed over this elegant Kiddush cup. Yair Emanuel lives and works in Jerusalem. In his studio he creates Judaica items by fusing traditional motifs and ancient Jewish manuscripts, with modern and oriental art.